The drug, regadenoson, is already commonly used to image cardiac patients' hearts. But the UVA research suggests it could be put to another, lifesaving purpose: battling ischemia reperfusion injury, in which tissue is damaged by the restoration of blood flow after it has been cut off. The principal investigator of UVA's trial, Christine L. Lau, MD, called ischemia reperfusion injury the "Achilles' heel of lung transplant." "Ischemia reperfusion injury directly correlates to the development of chronic rejection, which is the reason why 5-year survival in lung transplant recipients is only about 50 percent," said Lau, a surgeon at UVA. "Yet there really are almost no [other] clinical trials in lung transplant. This is our best hope." 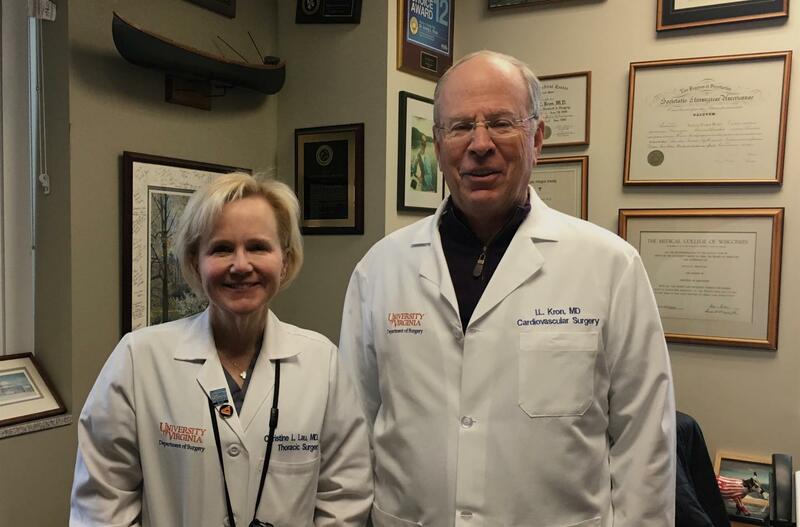 UVA surgeon Irving L. Kron, MD, has been working on the problem of reperfusion injury among lung transplant recipients since 1989. That year he performed a lung transplant that he said "couldn't have gone better." Afterward, though, the patient began showing symptoms of reperfusion injury, in which tissue is damaged by the restoration of blood after blood flow has been cut off. The patient survived, but Kron thought there had to be a way to protect patients from the surgical complication – a complication that often leads to organ rejection. He made it his mission to find a solution. As an academic medical center, UVA was the perfect place to tackle the problem, he said. In UVA's collaborative environment, doctors can observe a problem in the clinic or operating room and enlist the help and expertise of their colleagues across the Health System, from clinicians who treat patients to the scientists who do the fundamental research that provides the foundation for future treatments and cures. "We see the problems at the bedside, and we go to the bench and we try to come up with a fix," Kron said. "This clinical trial is a culmination of a lot of years of lab research and collaboration with a lot of partners." Lau and her team plan to evaluate the drug in up to 21 patients during the phase 1 clinical trial. They will first evaluate the safety of the drug among lung-transplant patients, seeking to determine the safest dose. For more details, including trial eligibility requirements, visit the trial's listing at ClinicalTrials.org, the federal government's trial database. The ultimate goal of UVA's decades of research is to determine if the drug can reduce or even prevent ischemia reperfusion injury. If so, that could be of tremendous benefit to lung transplant recipients. "Can you imagine," Kron said, "if you can wipe out chronic lung rejection?"